Reinforced concrete slabs do not rot and can maintain all its properties at high temperatures and humidity. It is an ideal material for the construction industry and housing and communal facilities. Reinforced concrete slabs at one time changed the canonsconstruction. Their low cost and high performance made a splash in the market. Because of this, many construction companies have been forced to give up his business or reoriented. The real shock for builders and designersIt was the length of a reinforced concrete slab, which reached seven and a half meters. 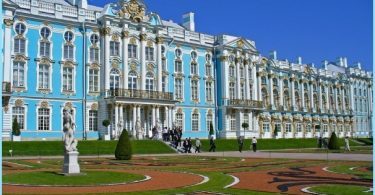 It has changed the very essence of architecture. 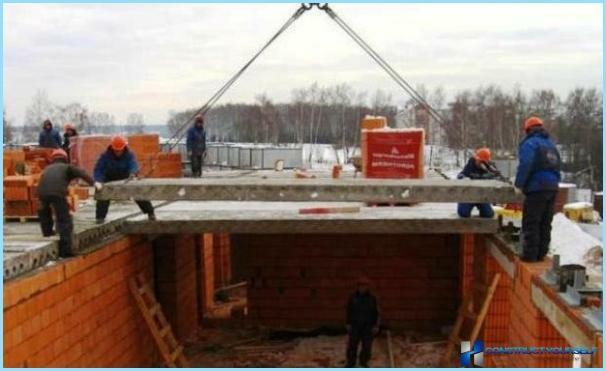 The result was not only new buildings, but also the technology of their rapid erection. This technology made possible the creation of complex road junctions. No highway or highway is not without these structural elements. Road concrete slabs retain theirperformance properties even at a temperature of -40 degrees Celsius. Use of these products in the construction of roads can largely increase the reliability of the whole fabric. These products are available in two versions: a Free of tension reinforcement and prestressing. Average density of concrete is 2200-2500 kg / m3. 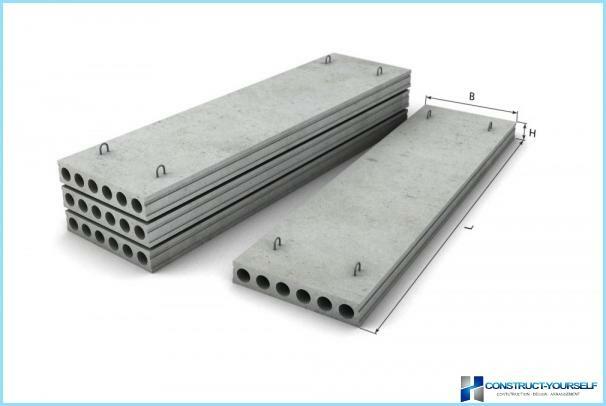 Road concrete slabs can withstand a load of class H-30 and H-10. The surface of the product has a special grooving. When you create a design used concrete, which is waterproof and frost meets the parameters F200 and W4. Important! Road concrete slabs may be different sizes. 1750h3000mm products with the parameters most commonly used. Special mention deserve the aerodromeconcrete slabs. They are able to withstand high loads. When you create this structure using a reinforced frame and concrete is not lower than the brand M350. PZHP used in the construction of interfloorfloors. The thickness of the product 220 mm in length and a half to sixteen meters. The standard width may be 1, 1.2 1.5 m. It is also possible the selection of individual parameters. Voids in concrete slabs providethermal and acoustic insulation. Holes may be either round or oval. The presence of voids in the weight greatly facilitates the design, which affects the speed of installation and the overall structure of the building. Modern technologies allow to produce large batches in a short time. The load on the concrete slabs can reach 1250 kg / m2. During manufacture concrete using various brands. Important! Installation is implemented by hinges that allow the structure to bring in the right place with minimal effort (using special equipment). PZHP are part of the carrier overlap inprefabricated buildings. In this case the calculated load should not exceed 6 kPa. 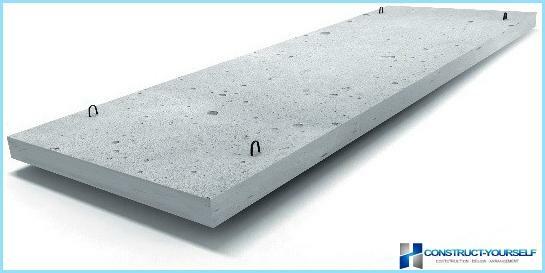 Reinforced concrete flat slab can withstand seismic shock force of up to 7 balls. They are mounted on structures with two, three and four points of support. The basic material from which madethe product is heavy, medium and light density concrete. It uses Free of tension reinforcement and prestressing. It is also allowed to use wire VR-1 class. All structural elements must meet state standards. Facets of flat reinforced concrete slabs can bebevels. They are used to interface between the products themselves. Also, such a structural feature prevents shifts. Seams between PZHP poured concrete solution. PZHP transported in stacks. 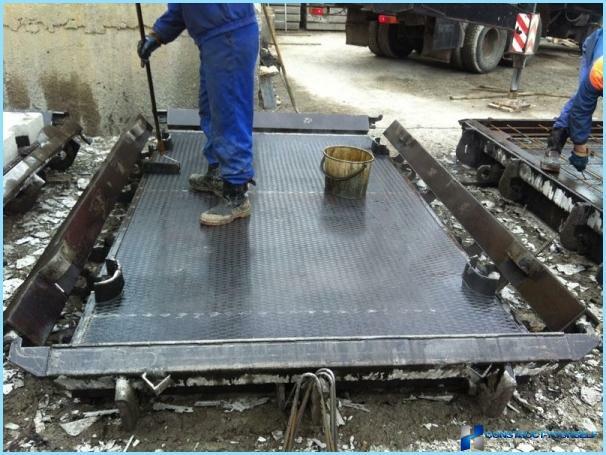 In order for products in transit are not damaged, used special pads to ensure the gap between the concrete slabs. In the back of the car flat concrete slabsstacked longitudinally in the direction of the axis in the direction of motion. Loading and unloading is carried out using a crane. Special mounting tabs greatly accelerate this process. These products are used when you need to completeconstruction. Most often such a need arises in industrial buildings where the builders do not want to spend extra money to install a full attic. In the future, such a roof is covered with a specialfinishing material. Most often it is bitumen or liquid rubber. These materials provide an excellent waterproof, and the cost is low. Concrete slabs covering perfectly matchwith insulating materials. In addition, installation of gutters and other engineering systems does not take much time and effort. Products are divided into two types depending on installation methods: standard and ribbed. Constructions with ribbed allowmake the roof more durable. Also this shape largely simplifies the process finishes. In the production of most intense activated valves. It provides durability. Important role in the design plays a reinforced metal mesh. It is covered with a layer of concrete up to 2 cm. This protects the valve against the hostile actions of the environment. Concrete slabs coatings have a high level of fire safety. Some modifications can withstand loads of up to 1500 kg / m2. Such products are used in places with an increased level of rainfall. Moreover, this strength makes it possible to build a few more floors if necessary. Typically, during construction using concrete slabs 3x6 and 2x12. But of course, there may be exceptions. Sometimes plants are special modifications for specific tasks. The thickness of the product varies from 250 to 455 mm. However, there are more options thick. Increased thickness gives weight reduction, respectively, minimizing the load on the load-bearing structures. In the structure of reinforced concrete slabs can not do without the mortgage elements. 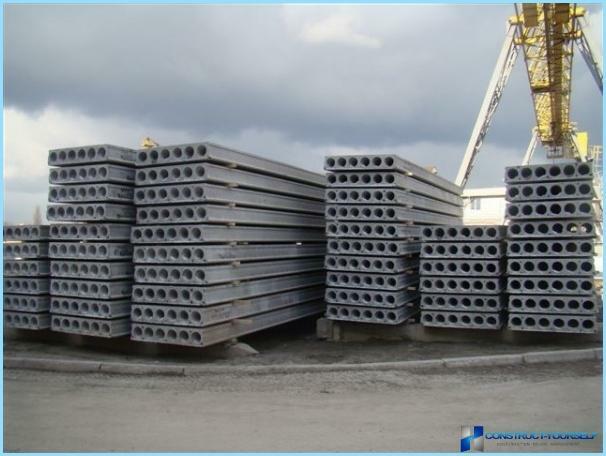 They are made of steel and are welded to adjacent reinforcement products. This provides a strong connection. Articles are transported on special trucks and are used at the end of the construction work. They are suitable for almost any type of construction and have high durability and reliability. 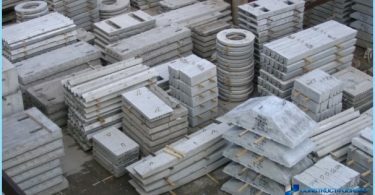 The main element of reinforced concrete slabs actsconcrete. This material is made by mixing cement with sand and gravel. It has a high resistance to compression, but easily gives stretchability. To increase the strength of the material used fittings. It is made of composite and steel. Important! 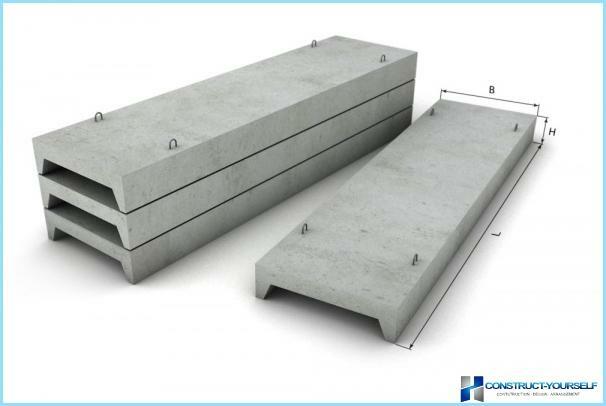 Concrete reinforcement protects against corrosion. Crushed acts as an inert material. Between him and the cement is no reaction. It is also called filler. It significantly affects the structure of the reinforced concrete slab. 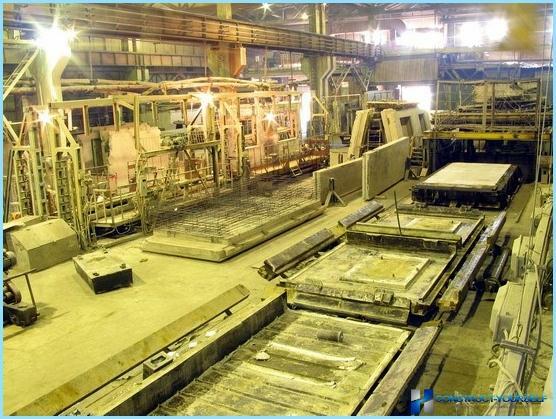 In the production of reinforced concrete slabs using gravel of different factions from the small and to large. The choice depends on the purpose of construction, as well as the requirements facing the designer. Reinforcement is of two kinds: the working and assembly. The first type is a lower part of a reinforced concrete slab. It works on a bend. The second is a skeleton construction. Important! Alternatively, a steel rod wire can be used. In the process of manufacturing concrete slabsused concrete stressful. Special technology allows the valve to fill in the monolith when it is in the form of a partially tense. 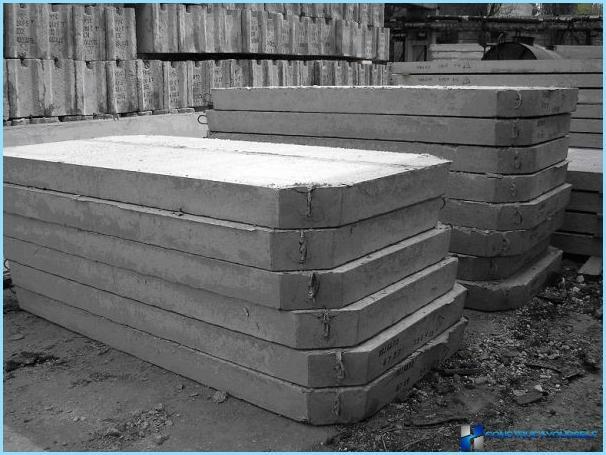 This is due to the fact that the reinforced concrete slabs must effectively resist bending and offset the load of the floor structure and the weight of additional items on it. In a specially prepared form of the reinforcement cage is installed. Usually this is done using the ribbed bars. They are pre-tensioned by means of heating or electric shock ram. The rods are fixed on board equipment shapes. A further manufacturing process is based on the assembly line, special stands, roll forming or rolling. After the formation of the basic structureconcrete slab is sent to the heat treatment. For this purpose, a special camera. Heat treatment allows to substantially increase the speed of solidification of the concrete mass. During 10 hours the product chamber about 60 percent gaining strength. Usually it takes at least 25 days in normal conditions. Once a product has gained the necessary strength to the walls are cleaned fastening shapes which reinforcement bars fixed. Rods compressed length. The result is a necessary condition of the assembly. This canonical manufacturing process reinforced concrete slab. But many companies are trying to bring into it something of their own to achieve greater productivity and reduce costs. During the installation slabs builders are primarily oriented to the construction regulations. Compliance with all norms and standards ensures the safety and long service life of the structure. Concrete slabs laid on the walls of the building. However, they must rely on the bearing wall is not less than 12 centimeters. The articles may be stacked with or without a solution. Size technological weld lies in the range of 5 to 20 cm. The ideal parameter 7-8 centimeters. If the seam is too wide, then in the future we will have to spend a lot of time and solution to its terminations. Naturally stacking rules, for example, roadconcrete slabs are very different from the rules of hollow mounting. But the start-up phase is the same in both cases. Before installing the stove carefully examined. This one must have markings on each design. If there are cracks wider than 1 mm over the entire length, it is replaced by reinforced concrete slab. Depending on its design and purposebuilders are using some form of concrete slabs. At the same time there are so many versions and types, calculated under certain construction.